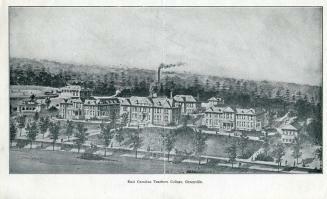 On October 5, 1909, the East Carolina Teachers Training School opened its doors with the mission of providing young men and women the training they needed to be able to teach in the public schools of North Carolina. The school was established in Greenville in 1907 at the urgent persuasion of former governor and Greenville resident, Thomas Jordan Jarvis. There were seven other eastern North Carolina communities vying for institution including Edenton, Washington, Kinston, New Bern, Tarboro, Rocky Mount and Elizabeth City. 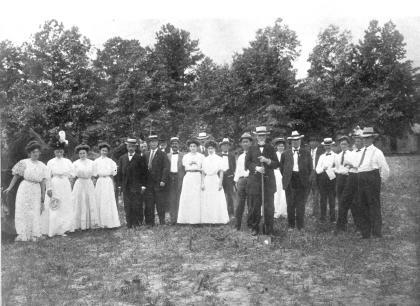 When the school opened in October 1909, there were 11 faculty members to teach the 104 women and 19 men enrolled in a two-year training program. In 1911, sixteen members of the first class graduated, all of them women. The first man to graduate, Henry Oglesby, did not do so until 1932. In 1921, the school began offering four-year degrees. The college offered its first master’s degree in 1929 and began to diversify its curriculum. The school was renamed East Carolina University in 1967, and was incorporated into the UNC system five years later. Today, East Carolina University is the third largest school in the UNC system, with an outstanding reputation in the fields of teacher training, music, art and medicine.